Pimento is an evergreen tree native to Jamaica and the Caribbean Islands. The Essential Oil of Pimento is extracted by steam distillation of its leaves and seeds. 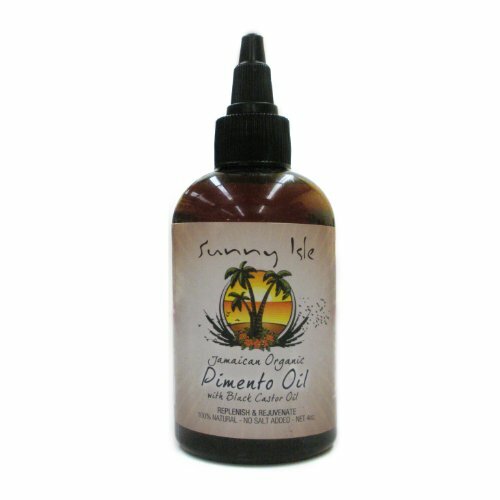 Sunny Isle Jamaican Organic Pimento Oil with Black Castor Oil (JBCO) increases blood flow to the surface of the skin. The increased oxygenated blood will repair, replenish rejuvenate and bring healing to our bodies. Sunny Isle Organic Pimento Oil with Black Castor Oil applied topically can give immense relief from arthritis, back pain and general muscle aches and soreness because Pimento is a natural analgesic. 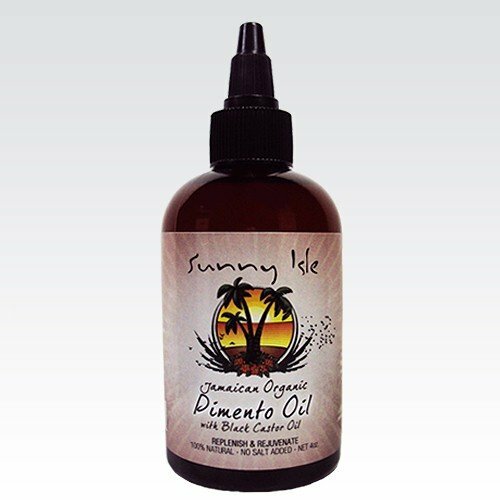 Sunny Isle Organic Pimento Oil with Black Castor Oil is also blended to promote Rapid Hair Growth as it includes Grape Seed Oil, Eucalyptus Oil, and Peppermint Oil. Peppermint is antibacterial and antiseptic so this is a self-cleansing blend that eliminates bumps and other scalp issues. The Pimento Oil stimulates the blood flow to the hair follicles and nourishes your hair. Massage into your scalp and edges to address traction and other types of alopecia and promote rapid hair growth. Use as a hair dress to moisturize and seal dry, breaking and fraying hair ends. This product will also help slow down the graying hair process. Pimento is a evergreen tree native to Jamaica and the Caribbean Islands. The Essential Oil of Pimento is extracted by steam distillation of its leaves and seeds. 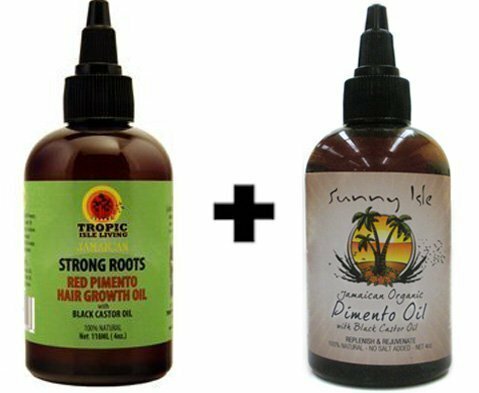 Sunny Isle Jamaican Organic Pimento Oil with Black Castor Oil will increase hair growth and thicken your hair. Why you may ask? Our Jamaican Organic Pimento oil increases blood flow to the surface of the skin. The air we breathe is oxygen. Oxygenated blood flows throughout our body. We need oxygen to breath as well to replenish and rejuvenate our cells. Therefore when blood flow increases to the surface of the skin the increased oxygenated blood will repair, replenish and rejuvenate the hair follicle cells. As a result your hair roots will be stronger and grow faster. Other benefits of Sunny Isle Organic Pimento Oil with Black Castor Oil are: Arthritis, Alopecia, Massage therapy for aches and pains, Helps with the graying process of hair. Derived from the Pimento berries of the Pimento officinalis myrtaceae in the West Indies, Pimento Berry Oil has a spicy aroma that is loved in the flavouring industry. 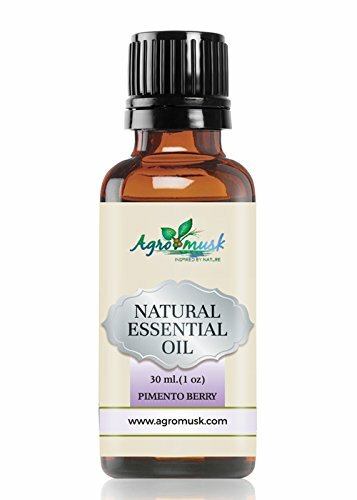 Through the process of steam distillation, the Pimento Berry Essential Oil is extracted from the dried Pimento Berries and also used in the perfume industry. Uses: Pimento Berry Oil is mostly used by the frozen food industry for flavoring. For its spicy aroma, it is also a common ingredient in men's cosmetics. 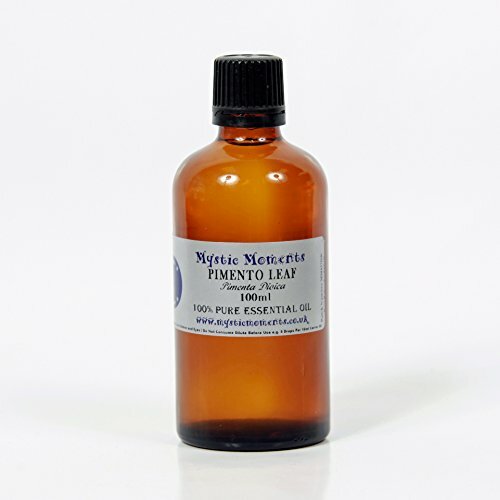 100% Pure Therapeutic Grade Pimento Essential Oil Comes in a 60ml amber glass essential oil bottle. European Dropper Cap included. What sets Healing Solutions Essential Oils apart is superior cultivation of ingredients that are the best in the world. Combined with superior distillation and bottling care process, We GUARANTEE that our oils are aromatically superior and more effective than any other oils - if you disagree we will refund your money! The Leading Aromatherapy Associations (Alliance of International Aromatherapists (AIA), International Aromatherapy and Aromatic Medicine Association, Aromatherapy Trade Council, and others) all state that essential oils should not be taken internally (regardless of purity or organic origin) unless under the guidance of a health care practitioner trained at an appropriate level . As such, all of our oils carry a label warning that the product is NOT FOR INTERNAL USE. 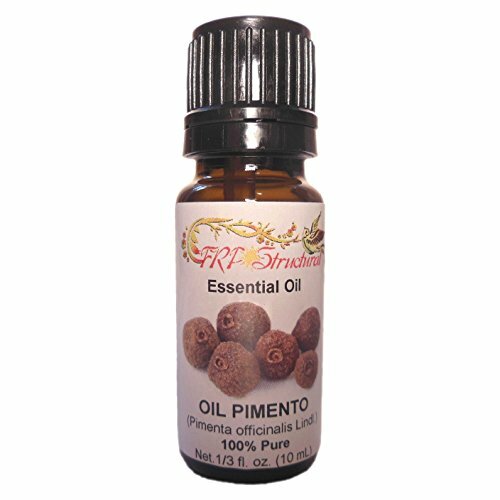 100% Pure Therapeutic Grade Pimento Essential Oil Botanical Name: Pimenta dioica Pimento Essential oil has a sweet and spicy aroma similar to cinnamon. Comes in 10ml amber glass essential oil bottle. European Dropper Cap included. What sets Healing Solutions Essential Oils apart is superior cultivation of ingredients that are the best in the world. Combined with superior distillation and bottling care process, We GUARANTEE that our oils are aromatically superior and more effective than any other oils - if you disagree we will refund your money!" The Leading Aromatherapy Associations (Alliance of International Aromatherapists (AIA), International Aromatherapy and Aromatic Medicine Association, Aromatherapy Trade Council, and others) all state that essential oils should not be taken internally (regardless of purity or organic origin) unless under the guidance of a health care practitioner trained at an appropriate level . As such, all of our oils carry a label warning that the product is NOT FOR INTERNAL USE. 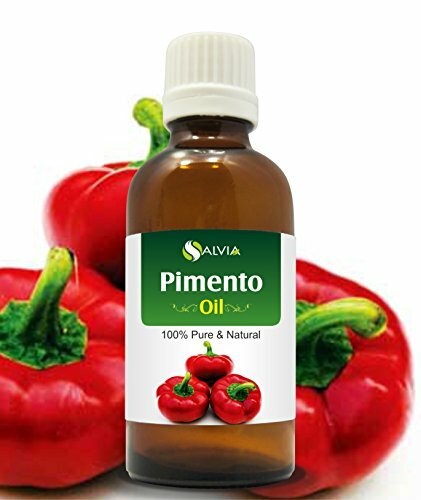 Pimento Oil is regarded for its use within personal fragrancing, massage, arthritic and muscular applications, Pimento Oil can be a dermal irritant. If you choose to use Pimento Oil within topical applications, be certain to dilute it very well. 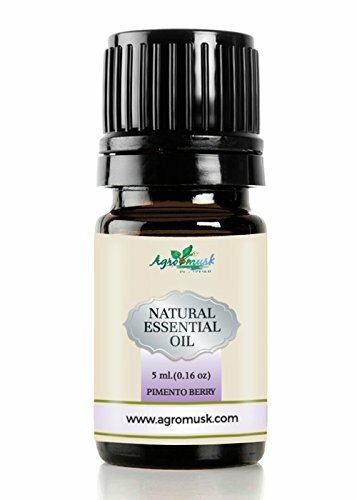 100% Pure Therapeutic Grade Pimento Essential Oil Comes in a 30ml amber glass essential oil bottle. European Dropper Cap included. What sets Healing Solutions Essential Oils apart is superior cultivation of ingredients that are the best in the world. Combined with superior distillation and bottling care process, We GUARANTEE that our oils are aromatically superior and more effective than any other oils - if you disagree we will refund your money! The Leading Aromatherapy Associations (Alliance of International Aromatherapists (AIA), International Aromatherapy and Aromatic Medicine Association, Aromatherapy Trade Council, and others) all state that essential oils should not be taken internally (regardless of purity or organic origin) unless under the guidance of a health care practitioner trained at an appropriate level . As such, all of our oils carry a label warning that the product is NOT FOR INTERNAL USE. 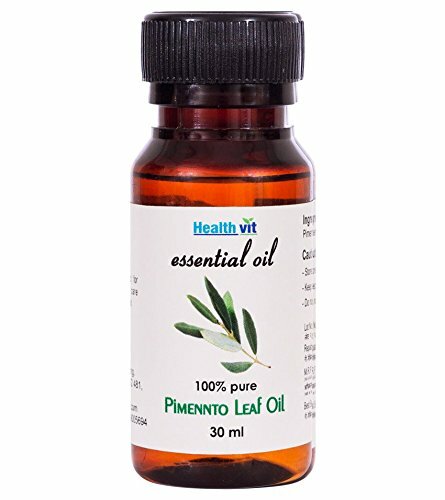 Pimento Leaf Essential Oil 100ml - 100% Pure Botanical Name: Pimenta dioica Plant Part: Leaves Extraction Method: Steam Description: This evergreen tree is indigenous to the West Indies and South America and reaches about 10 meters in height (approximately 30 feet) and begins to produce fruit in its third year. Colour: Yellow Brown Consistency: Thin Note: Middle Strength of Aroma: Medium Blends well with: Pimento Leaf works particularly well with Ginger, Geranium, Lavender, Orange, Patchouli, and Ylang Ylang. Aromatic Scent: Pimento Leaf carries a combination scent of cloves, juniper berries, cinnamon and pepper. This is the reason it is also referred to as Allspice. Of these scents, clove dominates. History: Pimento Leaf is also referred to as All-Spice. This is because of the combination of scents it demonstrates cloves, juniper berry, cinnamon and pepper. 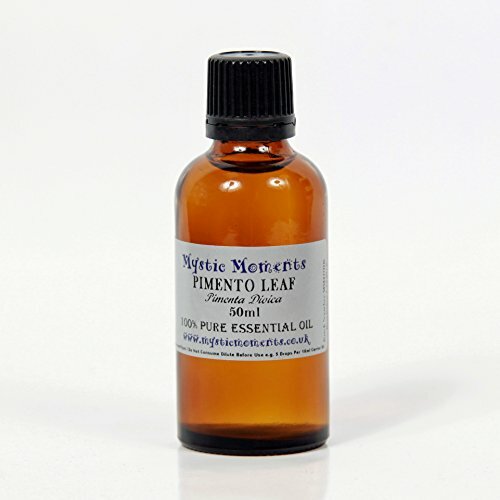 Pimento Leaf Essential Oil 50ml - 100% Pure Botanical Name: Pimenta dioica Plant Part: Leaves Extraction Method: Steam Description: This evergreen tree is indigenous to the West Indies and South America and reaches about 10 meters in height (approximately 30 feet) and begins to produce fruit in its third year. Colour: Yellow Brown Consistency: Thin Note: Middle Strength of Aroma: Medium Blends well with: Pimento Leaf works particularly well with Ginger, Geranium, Lavender, Orange, Patchouli, and Ylang Ylang. Aromatic Scent: Pimento Leaf carries a combination scent of cloves, juniper berries, cinnamon and pepper. This is the reason it is also referred to as Allspice. Of these scents, clove dominates. History: Pimento Leaf is also referred to as All-Spice. This is because of the combination of scents it demonstrates cloves, juniper berry, cinnamon and pepper. Smell similar to cloves Therapeutic Uses The therapeutic properties of allspice oil are anesthetic, analgesic, antioxidant, antiseptic, carminative, muscle relaxant, rubefacient, stimulant and tonic.Allspice oil can be helpful for the digestive system, for cramp, flatulence, indigestion and nausea. It can help in cases of depression, nervous exhaustion, tension, neuralgia and stress. Botanical Name: Pimenta dioica - Extraction Method: steam - Plant: leaves - Origin: Jamaica - General Pimento Leaf Information - Annual Pimento is a rubefacient and vesicant for the skin and a violent irritant for the mucous membrane. Taken internally, in small doses, it stimulates the digestive functions; a strong dose activates circulation and stimulates the genito-urinary functions; too strong a dose produces gastro-intestinal inflammation with vomiting, causing dizziness and a kind of drunkenness. Lozenges are made from it. 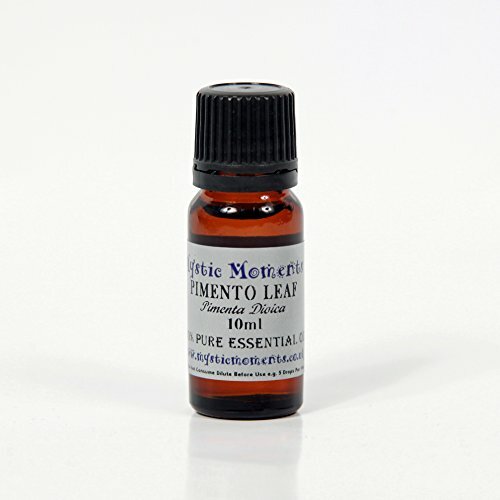 Pimento Leaf Essential Oil 10ml - 100% Pure Botanical Name: Pimenta dioica Plant Part: Leaves Extraction Method: Steam Description: This evergreen tree is indigenous to the West Indies and South America and reaches about 10 meters in height (approximately 30 feet) and begins to produce fruit in its third year. Colour: Yellow Brown Consistency: Thin Note: Middle Strength of Aroma: Medium Blends well with: Pimento Leaf works particularly well with Ginger, Geranium, Lavender, Orange, Patchouli, and Ylang Ylang. Aromatic Scent: Pimento Leaf carries a combination scent of cloves, juniper berries, cinnamon and pepper. This is the reason it is also referred to as Allspice. Of these scents, clove dominates. History: Pimento Leaf is also referred to as All-Spice. This is because of the combination of scents it demonstrates cloves, juniper berry, cinnamon and pepper.